Intro: Almost ten years ago, in October of 2001, I completed my first Avon walk for breast cancer, twenty miles a day for three days. * It turned out to be life-changing in completely unexpected ways. Originally we were to walk in early October down from Bear Mountain, beside the Hudson River and across the George Washington Bridge into Manhattan. Closing ceremonies were to be at Bryant Park, near the main public library in New York City. I’d been training for months, and I’d raised the money I needed to walk. But on a single day, all plans changed–for the walk, for the country, and for me. My little personal concerns merged–in my mind–with huge national issues and the suffering of many. On the morning of September 11, I left my office to pick up my mail and found my colleagues clustered around a television in the lounge. Two planes had flown into the World Trade Center and both buildings had collapsed. Like everyone else in the country, I watched the videos over and over again until my mind was numb. Then I went back to my office. Because I couldn’t concentrate, I thought it a good time to check with my doctor about the results of a follow-up mammogram. I found out I needed to see a surgeon. Before the day was over, plans for the Avon New York Walk for breast cancer were in disarray. No one even knew whether the walk would be held. Perhaps the organizers didn’t know what to do. Certainly New York officials were not prepared to let several thousand people, mostly women, walk over the George Washington Bridge, walk through the streets of Manhattan, and congregate in Bryant Park. For a few weeks, we walkers sent a flurry of email to the organizers and to each other. Eventually we were told the walk was on, but postponed to the end of October and we wouldn’t be allowed to walk across the bridge into Manhattan. 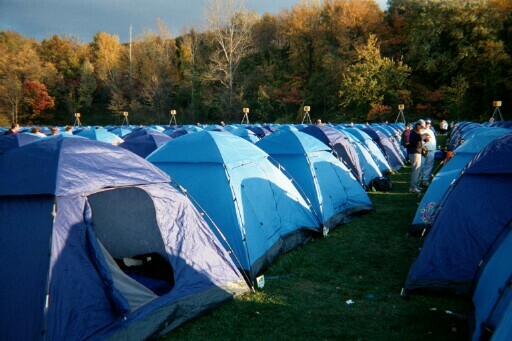 Instead, we would spend the final day walking around Rockland County and have closing ceremonies at a community college. Disappointing, but understandable. On the weekend of the walk, I was excited about walking but worried about my biopsy, scheduled for the Monday after the walk. I was still reeling from the events of September 11th, and so was everyone else. Almost everyone walking that weekend was a New Yorker, and everyone had a story to tell of a friend or relative touched by the tragedy. Many had been close enough to see the flames and smoke, to breathe in the evil fumes. We told each other stories. Even I, living upstate, had a story or two. I told of my son who had taken the train into Grand Central Station on 42nd St. arriving minutes before the first attack downtown. He saw the flames above the NYC skyscrapers as he began walking towards his meeting. Cell phone lines were jammed, his meeting surely cancelled. Soon after he returned to the station, it was evacuated. He began the long walk, in business suit and dress shoes, uptown, away from the disaster. Every face he saw was serious and stricken; no one was unaware or unaffected. He heard snatches of news on car radios. He stopped for lunch on 95th St. where he joined stunned New Yorkers. Late that day he reached the 125th station in Harlem and later still, he was able to catch the first train leaving the island of Manhattan to go home. I told the story of my husband’s son-in-law who had been in the World Trade Center during the first attack on it ten years earlier. He descended dozens of floors in a smokey stairwell, carrying a frail, elderly woman on his back. He laughs when he tells us that she was complaining because she was uncomfortable. The story that haunts me, even after all these years, was that told by a young firefighter. He had been told to come late that morning because it was his first day of work. By the time it was time for him to go in, every other firefighter in that station was dead. And all the while we were trying to exorcise the pain of September 11th, we also talked about breast cancer–care, treatment, options, people who had survived, people walking for others’ health or memory. Several offered me advice about my own treatment to come. was scheduled for surgery when I got home, I took no pills, but lay in my sleeping bag thinking cranky thoughts. Miraculously, our discomfort and our fears for our country and our health only intensified the spirit of triumph on the walk. Even though we might not change a single life or single event, we were trying to express something positive. We were walking. We would support others and we would face troubles with dignity and courage. Our stories mattered. Here is one. I had met a young woman, in her early thirties, when I was training for the walk. Both her parents had died, her mother of breast cancer. She had cystic fibrosis, and her training was frequently interrupted by hospital stays. She told me that friends and family had warned her that she shouldn’t walk. It was much too hard for her weakened body. In the end, she was too sick to walk, and it was I who wrote her mother’s name on the wall honoring the memory of those who had died of breast cancer. And we walked. Volunteers played music at rest stops, doled out hearty portions at mealtimes, posted funny signs along the way. At rest areas, they passed out Gatorade, bananas, granola bars, Band-Aids, souvenir stickers for our name tags. One young man parked his van along the way each day with his baby son sleeping nearby. He passed out candy and cracked jokes. His wife was one of the walkers. A bakery near the Tappan Zee Bridge distributed pink cookies in the shape of ribbons to honor an employee who had struggled with cancer. An elementary school band played “When the Saints Come Marching In” as we straggled into their town for lunch. Their hand-made posters were plastered on every pole along our route. At the end of each day we might have been tired and have blisters, but our legs and lungs and hearts were all still working, one step at a time. And the bright-colored autumn leaves on the trees were stunningly brilliant. The Hudson River was never more beautiful. My husband met me at the finish line. He’d been my supporter all along, even walking with me often when I was training. My son and his family, my stepdaughter and her family, my friend and her daughter all met me too. Life seemed impossibly hopeful and achingly meaningful. So I’ve decided to walk again this coming October provided that my senior-citizen body cooperates. (I’ll have a serious talk with it.) This post is my commitment to register and to put on my sneakers and head for the park. 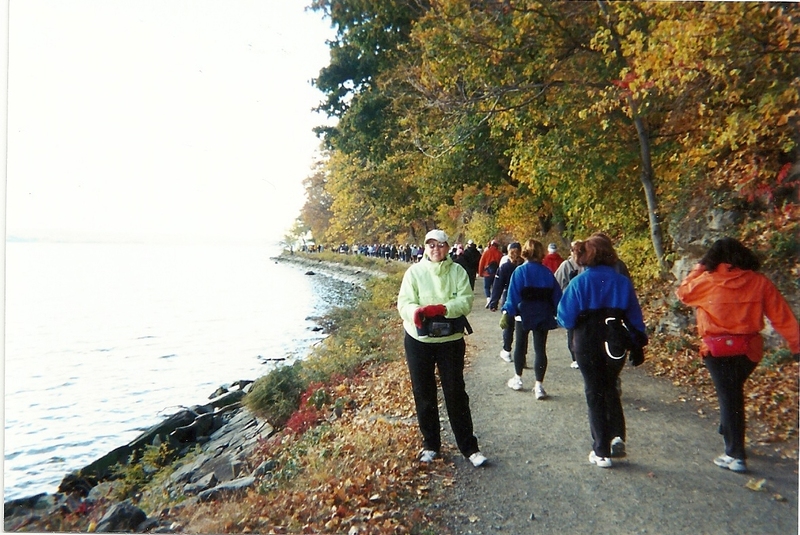 Because this fall it will be ten years since September 11th, ten years since I walked for the first time, and ten years since I had my brush with early-stage breast cancer. I was luckier than many. My niece Tina, lovely Tina, died of breast cancer, leaving behind a husband and two little girls. Because I want money spent on research to eliminate the disease so my daughters-in-law, stepdaughters, and granddaughters will never fear the disease. Because I want to join others trying to be decent, kind, and brave, by putting one step forward and then another. And because the leaves and the river will be beautiful in October, again, and life worth celebrating. If you’d like to support me this year when I walk in October, please visit my Avon page at http://info.avonfoundation.org/goto/MargaretFrench. Just so you know… After my second walk, in 2002, the Avon Foundation parted company with the company that had organized their 3-day walks. Now there are two long walks for breast cancer in the United States: the Susan G. Komen 3 day and the Avon 2 day. Intro: A story about jobs, job equality, and family. Enjoy. In the summer of 1961, I needed a job. I’d been accepted at a university down east, scholarship and all. But I’d need money for the train fare from Alberta to Montreal and for clothes and spending money. Lucky for me, when it came to getting a job, I had family connections. My mother was head secretary in the Purchasing Department of the University Hospital in Edmonton, Alberta, my home town. She’d been there for years and knew everybody. More important, everybody knew her. She was known to be a perpetual motion machine. She walked faster than young men ran. She came early. She worked late. She told me that the hospital was looking for ward aides for the operating suite—and she knew the head of housekeeping, the woman who would be my boss. Well, that job in the operating room suites was miserable. For eight hours a day, in a windowless room, for $135 a month, I folded doctors’ gowns and wrapped them for sterilizing in an autoclave. I emptied giant laundry baskets. On other days I washed kidney basins or served endless cups of coffee to cranky interns. I didn’t learn numbers because it was hard to reach that far. Besides, numbers were boring. I didn’t learn how to use carbon paper either. The next summer I interviewed with the head of Payroll. He expected I would be a good worker—because he’d seen my mother speeding down the halls. Little did he know how different I was from her. He asked me how fast I could type. I had no idea. “Forty words a minute,” I said. I was supposed to cover for each of the women in payroll as they took summer vacations. The first day was very hard for someone who knew precious little about typing. The boss asked me to type a letter that he’d written by hand. Wouldn’t you know, the substance of that letter—and every other letter that left payroll–was chock full of numbers! And he wanted three copies in addition to the original! When he left the office, I looked over at the other women to spy on their carbon paper techniques. Hard to remember which side went up. Hard to figure out how to hold all those sheets together. Hard to fix the mistakes with those little slips of correcting paper tucked between. The envelope was a nightmare. Slap, tap, release, shove the envelope to the correct spot. Even so, the address was always wrong: too far to the left or right, too close to the top or bottom, and too slanted. I threw away the messy copies and started over. By the end of the day, I’d completed one perfect letter and envelope. I’d even corrected my boss’s spelling while I was at it. My wastebasket, however, was overflowing. I’d done nothing else all day long. My boss was happy with perfection and strangely oblivious to my astonishing lack of speed. I soon was permitted to operate the giant payroll machine, perhaps because no one else wanted to do it. I would go into a small room, alone, carrying huge hand-written spreadsheets detailing the salary and deductions for hundreds of employees. Now, as it happens, I am a person who hyper-focuses. If I’m concentrating on something, the rest of the world disappears. When I was a teenager, I melted not one, but two whistling tea kettles while sitting four feet away, reading a book. The darned things apparently whistled until they ran dry and then slowly melted into globs on the stove. By great luck I didn’t burn the house down, and I became a well-read person at an early age. Hyper-focusing is a great asset if you’re using a payroll machine. There I was, sitting alone in front of a humongous machine in a separate room. Column by column, row by row, I entered thousands of numbers. I could take my time. I didn’t have to pretend to know where the numbers were. No one would disturb me until I was done because if I made even a one-cent error, we would need to spend the better part of a day finding it before we could start the next payroll. When each payroll was complete, I’d have stacks of printed records and stacks of employee checks. I have never loved any work as much as I loved using those machines. While I was doing the work that others found too mind-numbing to do correctly, I was memorizing the salaries of every employee in the hospital. I found out some interesting things. In those days, different jobs and different salaries for men and women were taken for granted. The job ads in newspapers were divided into two sections: those for men, and those for women. The good jobs, the high paying jobs were in the men’s section. I was to find out, as I sat at the payroll machine memorizing salaries, that salaries for women WEREN’T FAIR. At home I informed my mother of this gross miscarriage of justice. And do you know how much janitors make? $300! That’s twice as much!” My voice rose, indignant and shrill. The next day, injustice in the world or not, we were both back at work at the hospital. She was, as she often told us kids, indispensable. She could lay her hands on any piece of paper in the office in seconds. She knew the order number of every product that the hospital regularly stocked. She knew every vendor. She did all the ordering for all sorts of products, from toilet paper to syringes. She trained the new secretaries and the young male buyers, fresh out of school. I graduated from college. By then, it was the mid-sixties and women’s lib was in the air. Betty Friedan had written her book The Feminine Mystique. Women were beginning to dream new dreams. It wasn’t that they hadn’t wanted equality before. Of course they did. But now it felt possible. My mother was still head secretary in purchasing at the University Hospital. A position as junior buyer was posted. She fumed for days about how she knew more than all those young men put together. She was sick and tired of having to train them to do the very work that she was already doing—for a secretary’s salary. And all the women that she had coffee with every day agreed that the system was unjust and that she should apply. But still—what would people think? That she had a lot of gall? A middle-aged secretary who thought she could be a buyer? It was, always had been a man’s job. Every day she agonized over the decision. Finally, a couple of days before the deadline, she decided that come hell or high water, she would do it. The women that she had coffee with cheered. Defiantly, she walked her application down to personnel and plunked it down on the desk. Defiantly she returned to her office. Later that day Mr. Beaton stopped by her desk to talk to her. She got the job. First woman buyer ever at the University Hospital in Edmonton, Alberta. I suspect she didn’t get paid as much as the male buyers got paid. But she got paid a lot more than she’d got as a secretary, and it made a big difference in the retirement income she got a few years later. Even more than that, she felt that an injustice had been righted. She had been recognized in ways more substantial than praise and a little gift at Christmas time. As for me, I’m proud of her. 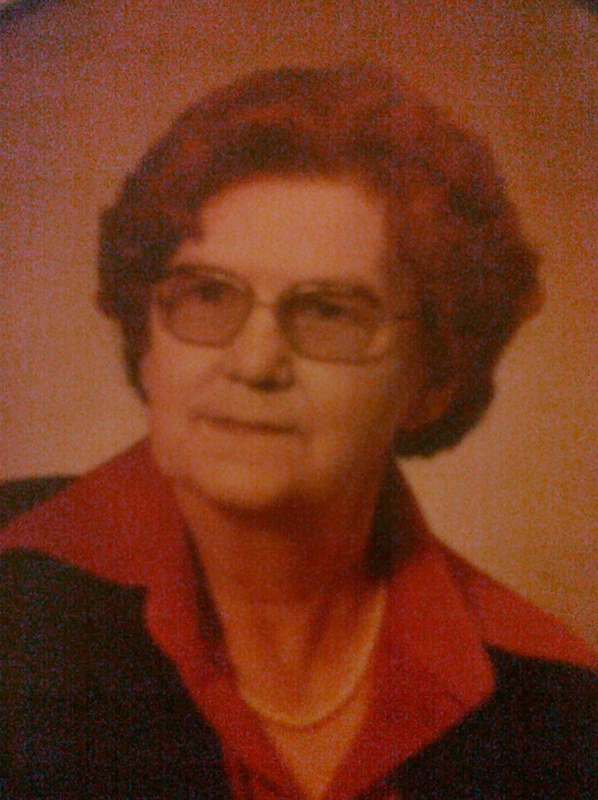 After all, my mother was the first woman buyer at the University of Alberta Hospital, Edmonton, Alberta, Canada. 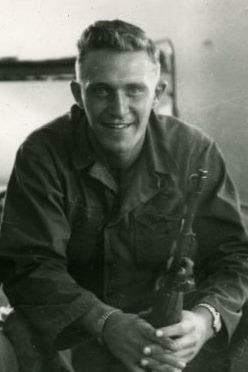 Jay in the army with his rifle. Intro: I held this post a few days…in Tucson, Obama had made the case for civility far better than I ever could. Still, I like this story, hope you do too. My husband, Jay, and his brother-in-law Herb were both drafted during the Korean War. In basic training, each was issued an M-1 rifle and a bayonet. Everyone except Herb. He lunged forward with the others, but only mouthed those offensive words, unable and unwilling to utter them out loud, hoping the sergeant wouldn’t notice. The Herb I’ve come to know is unfailingly gentle and kind. No doubt the army was wise, back then, to assign him to a desk job. It’s the army’s job to train people to use the weapons they’re issued. That can’t be easy. The army must realize that a man’s heart and mind have to be adjusted before he’ll be able to plunge a sharp bayonet into another human being. So they use the power of words. Do any of us really believe that “words can never hurt us”? Don’t all of us live with the hurt inflicted by a sharp-tongued relative or friend? Were none of us ever influenced by the words of another, especially when uttered passionately? Public figures who use violent words and violent imagery absolutely don’t mean for us to shoot political opponents. They want higher ratings or they want our votes. But I for one will watch other programs; I’ll read other writings; I’ll vote for other people. My husband, Jay, has asked me to add a note to this post. If I’ve described Herb, who wouldn’t utter the words, as gentle, how does that make Jay look–and every other young man who did what the drill sergeant told him to do? Let me assure you that Jay is also a gentle, good man. That’s why I married him. Intro: Usually, I avoid controversy. Not always. My father was a hunter. Grouse, mostly. Once he shot a deer and I cried to see it. He kept his rifles in a closet ready for hunting season: A .22, a shotgun, a 30-30, and a 30 ought something. He kept the bullets hidden safely somewhere else. Once my younger brother, twelve or so, decided to show off the guns to a buddy. He pulled a trigger and shot a hole through the television, the drapes, and into the wall. Somehow or other, one bullet had been left in the rifle. My parents were stricken by the thought of what might have happened that day. This is not written as a lecture about the evils of hunting. It’s a much simpler thought. Guns are dangerous. We never expect things to go wrong. Sometimes they do. That same summer, in the army camp where we lived, another twelve-year-old boy and his sister, fourteen, were alone at home. They were arguing in their front yard loud enough for all the neighbors to hear. Several were watching through their living room windows, annoyed by the commotion created by the squabbling kids. And again and again, the boy fiercely denied it. 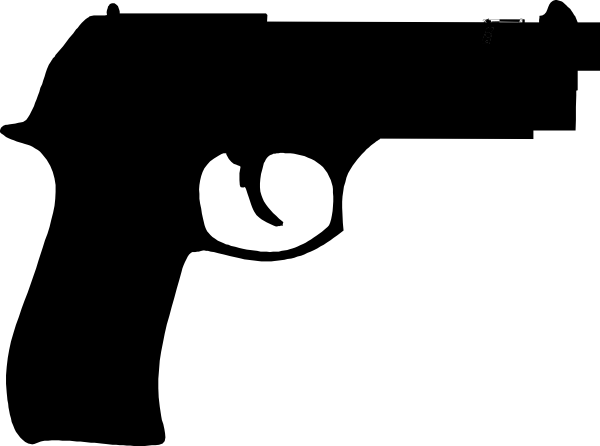 In the next instant, he pointed the revolver towards his own head and pulled the trigger. And quicker than thought, the promise of a young boy’s life was forever gone. In Arizona a Congresswoman is fighting for her life. Others are in serious condition. Several are dead, including a federal judge and a nine year old child. It seems this is all because a young man who apparently is mentally unstable was able to buy a gun. Intro: I love the fancy traditional meals that we’ve been enjoying over the holidays. Here’s a story about expectations related to food. And just maybe, it’s a longing for summer foods, in this, the coldest month of the year in Saratoga. When I was nine, my family moved to Calgary, Alberta. Horse country. Big cattle ranches. Rodeos. In Calgary, you can saunter down the street wearing a cowboy hat and fancy cowboy boots and not feel foolish—even if you happen to be a teacher or a construction worker or a poet. In Calgary, my father made a new friend, an ex-bronco-riding, calf-roping cowboy named Slim. Dad bought two horses from him, a big feisty buckskin and a gentle bay mare named Talullah, a horse for him and one for me. Why just me, you say? Well, my little brother was a toddler. My older brother came down with polio and couldn’t ride. My sister thought that horses were smelly and disgusting, and my mother didn’t care to ride. So it happened that my father and I rode together, almost every day, for several years. Good years. Every once in awhile, our horses needed shoes. And he and I would ride on paved streets around the edge of Calgary to the blacksmith’s shop. I loved everything about the shop. The strong warm smell of the horses mixed with the burning smell of the fire. The flames that lit up the room, casting shadows on the plank walls. The massive iron tongs, hammer, and anvil. The hiss when the hot iron shoes hit the water. I even liked to see him pare the hooves and nail on the horseshoes, reassured by my Dad that it didn’t hurt. When I was not quite thirteen, my father was posted again, this time down East. Before we left Calgary, the blacksmith and his wife invited us to their home for a farewell dinner. Their house was next to the shop, but I had never been inside. I wondered—I worried—that the house would be the same as the shop and the lot. I liked the look of the place, but what would my mother say? The blacksmith’s shop was a dilapidated, ramshackle place in need of paint. It always reminded me of the Ma and Pa Kettle movies I watched on Saturday mornings. Outside, in their dandelion field of a yard, was a shed with a purebred stallion that the blacksmith put out to stud; another shed with cocker spaniel puppies for sale; stacks of wooden crates, in case he wanted to start a mink ranch some day; and goats. I was quite sure this was all irregular, something my mother would not approve of. I also wondered what kind of meal they would serve. I have always been a person passionately interested in food. And, even then, I gave much thought to the meal we would be given, and I worried…would this eccentric couple come up with a meal my parents would find acceptable? We didn’t eat at other people’s houses very often, but I knew what was normal, expected, and proper in a meal in my world in 1956. There must be some kind of meat: roast beef, roast pork, roast chicken, meatloaf, hamburgers, pork chops, maybe ham. There must be potatoes: boiled, mashed, baked, scalloped, hash, or potato salad. And there must be some kind of vegetable, probably canned. Canned peas, canned green beans, canned wax beans, canned corn. Maybe canned corn with pimentos, something fancy. Maybe we’d have molded jell-o with grated carrots or celery. Maybe a salad with iceberg lettuce. And for dessert—well, my father might hope for pie—but as for me, I preferred cake. Spice cake, yellow cake, white cake, upside down cake, tomato soup cake, wacky cake, marble cake, blueberry cake, gingerbread are all good. But I was hoping for devil’s food cake–with sweet seven-minute frosting. One August evening, we went to the house and were invited inside. I looked around. None of the rickety chairs around the dining table matched. Nor did the plates on the bare wood. And other than plates, knives-forks-and-spoons, glasses, salt and pepper, and butter, there was nothing on the table. The blacksmith and his wife were both behind the kitchen door. “It smells funny in here!” my kid brother blurted. I understood the message. Nurses, taught to be acutely aware of hygiene, should not have a house that smells of goats, even after they retire. A few minutes passed. And then the blacksmith opened the door, and the blacksmith’s wife came in carrying a big galvanized steel tub, the kind people used to wash clothes in years ago, the kind people carry ice and beer in, to the patio nowadays. But this tub was filled with neither. She sat it down on the wooden table. It was almost full—of corn on the cob. And that was it. No meat, no potatoes, no canned vegetables. 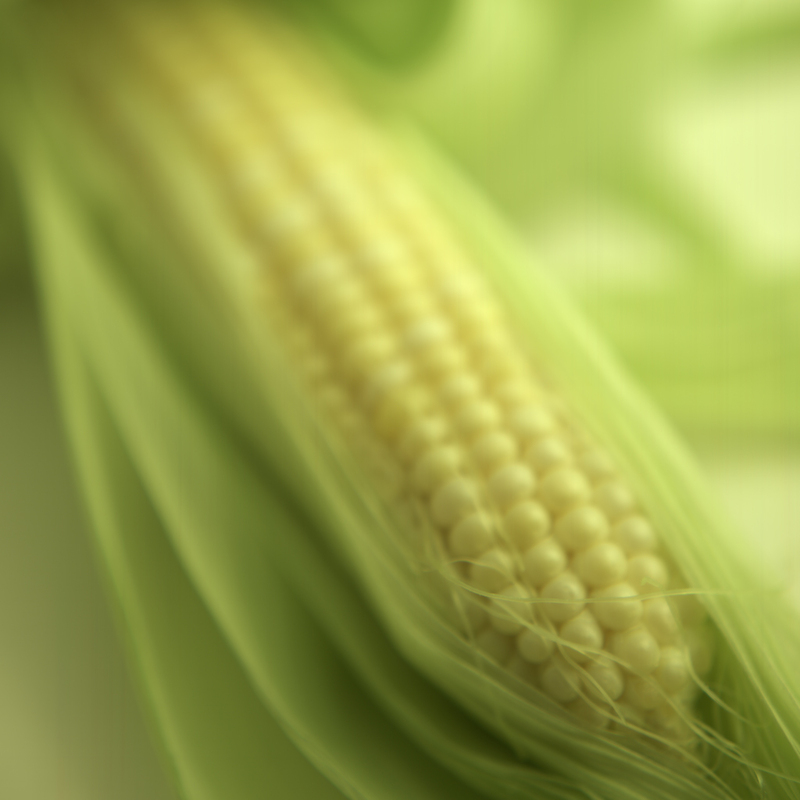 Just corn. I like corn on the cob. We had it a few times every summer. My mother would give us one ear, one and a half, maybe two. Never more. But today we could eat as many ears of corn on the cob as we wanted to, all slathered with butter and sprinkled with salt. I ate many. When we’d all had as much corn as we wanted, she took the galvanized tub away. I looked sideways at my parents, looking to see their reaction. Only a minute or two passed before she came back through the kitchen door, holding the door open with her hip, both hands wrapped around a huge watermelon. I also like watermelon. And we had it every summer too, once or twice. And we would be given a big slice or maybe two. But as much watermelon as we wanted? That was something else. And that night I ate a lot of watermelon. I hoped not. That would spoil everything. My parents looked at each other. I waited. “I told you they were eccentric,” my father said. They both laughed. “Good corn,” my mother said. “Good watermelon too,” my father replied. I could relax. The meal would not be marred by their disapproval. I was free to enjoy it completely.